Lindsey Beckley: Imagine this: it’s the year 1918. You’ve got a job, a family, a home. You’ve put down roots in an Indiana town. Suddenly, there are reports of an unexpected threat looming on the horizon. At first, public officials downplay the danger but you can hear the whispers of coming attacks. You read newspaper reports on how best to keep you and your loved ones safe. You see reports of the first casualties. Next, you hear the call to service. Knowing all too well the dangers involved, you answer that call. You leave your home, your family. You wear a uniform to serve your county. The nation is at war, but you’re no soldier. You’re a nurse. And the enemy isn’t a mass of men in some foreign land. It’s the flu. And it has come to Indiana. On this episode of Talking Hoosier History, we’ll discuss the 1918 Influenza Epidemic in Indianapolis. Hello, and welcome to Talking Hoosier History, brought to you by the Indiana Historical Bureau. For over a century, we’ve been marking Hoosier History. Now, it’s time to start talking Hoosier history. I’m Lindsey Beckley and I’ll be your host. Voice actor reading from Vaughan:[Influenza] encircled the world, visited the remotest corners, taking toll of the most robust, sparing neither soldier nor civilian, and flaunting its red flag in the face of science. Beckley: While his words are accurate, they fail to capture completely the death and destruction wrought by this malady. It’s hard, really, to convey the magnitude of the 1918 Spanish Influenza Pandemic. The numbers are almost too high to comprehend; even conservative estimates say 50 million people succumbed to the flu itself or to the pneumonia that often followed in its wake. That’s almost 5 times the number of military deaths in all of World War 1, in just half the time. Not only unique for the extraordinarily high number of people it killed, the 1918 strain of influenza was also unusual for who it killed. Historically, influenza is only deadly to the very young, the very old, and those already weakened by another illness. In contrast, the 1918 strain often killed healthy individuals from 20 to 40 years old, making it seem as though no one was safe from the ravages of the disease. This unique characteristic had another consequence; those men and women who were tasked with caring for the sick and dying were themselves susceptible to the illness. Scientists now believe that the origin of the pandemic was most likely at a crowded army camp in Fort Riley, Kansas. As the troops from that camp were shipped out to join “the war to end all wars” they came into close contact with other soldiers, spreading the virus throughout Europe. While the governments of most European nations censored reports of the outbreak, Spain did not. As a result, newspaper reports made it seem as if Spain was particularly hard hit by the first of the three waves of the virus, Thus, the strain was dubbed “The Spanish Flu.” Indiana was untouched by that first wave of the pandemic, which started in March 1918. We wouldn’t be so lucky during the next wave. Beckley: In August 1918, the War Department announced that the majority of Fort Benjamin Harrison, just 9 miles north east of Downtown Indianapolis, would be converted into General Hospital 25. Workers began to make accommodations for the care of a few hundred soldiers who would be returning from the European front wounded and “shell shocked.” But those beds would not be filled with causalities of war. Instead, they began to fill with soldiers who were falling ill.
On September 26, the Indianapolis News reported influenza outbreaks at 2 Indianapolis area military training detachments; 125 cases were reported at the detachment station at the State School for the Deaf and 60 cases at Fort Benjamin Harrison. While the Deaf School was quarantined, state and city officials reassured citizens that this was not the deadly Spanish influenza, and that an epidemic was not feared. While those reassurances were on the front page, page 22 of the same paper told a bleaker tale. Voice actor reading from newspaper: [Spanish Influenza] is not yet epidemic in Indiana – only a few mild cases reported and no deaths. It has invaded several of our training camps and will doubtless become epidemic in civil life. Voice actor reading from newspaper: Don’t worry, don’t feast, don’t hurry, don’t fret…Eat only plain foods avoid riotous eating of flesh. Beckley: Despite such advice and the efforts made to stop the epidemic before it started, the city would be teeming with infected individuals in just a matter of weeks. Newspaper reports provide a near daily account of the epidemic in the city and in nearby military camps throughout September and October 1918. Each day, the reports from the Indianapolis News grew more dire. Day one – September 26, 1918 – Fort Benjamin Harrison reports 60 cases. No infected Indianapolis citizens. Day two – September 27, 1918 – Indianapolis Mayor Charles Jewett directs preventative measure be taken to prevent the spread of the disease. Voice actor reading from newspaper: All public places – hotel lobbies, theatres, railway stations, and street cars – placed at once in thorough sanitary condition by fumigation and cleansing. Beckley: He also directed the Indianapolis police chief to strictly enforce an ordinance against spitting on the sidewalks, a practice thought to spread influenza. Despite city officials’ best efforts, the flu had spread to the civilian population. Voice actor reading from newspaper: Dr. Herman G. Morgan, secretary of the city board of health, said the reporting of only a few cases should convince the public of the urgent need of co-operating with the health authorities to the fullest extent in the effort to keep the disease from spreading. At Ft. Benjamin Harrison, Military officials reported a shortage of trained nursing staff to newspapers. With 500 cases of “respiratory disease”, the hospital was already well over their 300 bed capacity and was pulling from the ranks of medical personnel stationed at the base to care for the sick since only 20 nurses were left in the camp; the others had been sent to help at a different camp which was also in the throes of the epidemic. Day 6 – October 1, 1918 – 10 new civilian influenza cases reported, bringing the total to 14. At Ft. Benjamin Harrison, officers are confident that the outbreak is under control. Citizens rush to buy disinfectants to combat the spread of disease. Voice actor reading from newspaper: Medical officers were confident the disease is under control and will soon be overcome. There have been no deaths. In fact, many of the cases recorded as influenza, under other circumstances would be regarded bad colds. Beckley: A mere one percent drop in newly reported cases prompted the officers at Ft. Ben to release that statement to the Indianapolis news, most likely to reassure the civilian population that all was under control and to quell their fears. Although no deaths had been publicly reported in the city or even in the fort, Indianapolis newspapers ran stories of uncontrollable outbreaks of disease in other cities, outbreaks which often started at an outbreak at a military base. And the reports were starting to hit close to home; Hoosier soldiers stationed at a base in the Great Lakes region had contracted the flu, and several had already died. Perhaps it was understandable, then, that community leaders were attempting to keep people calm while encouraging them to take steps to protect themselves. Unfortunately, the methods used were not up to the task of warding off the escalating crisis. Voice actor reading from newspaper: A sweeping order prohibiting public gatherings of five or more persons was issued today…as part of the program to prevent an epidemic of influenza in Indianapolis. Beckley: As the number of cases increased and death tolls rose, the city board of health took action by banning public gatherings. This was a bold move which affected theatres, churches, and even schools. Learning from the mistakes other cities had made, Indianapolis city officials took decisive, cohesive action in the face of mounting tragedy. While their actions almost undoubtedly saved lives, at least 10 civilians had died by this point as well as 41 soldiers in the military camps. Ten of those deaths occurred all in a single night at Fort Harrison. The medical staff shortages were becoming more problematic as more and more young people fell ill. The Indianapolis News reported that “soldier boys are dying for lack of trained help.” To try to fill the void, newspapers began to print pleas for trained nurses to volunteer at Fort Harrison and other military bases. Many Indiana women responded to that call. Beckley: Student nurses from the Lutheran hospital in Fort Wayne were among the first to answer the call, as reported in the Fort Wayne Sentinel. Voice actor reading from newspaper: Willing to risk their lives in the nation’s service in helping combat the ravages of Spanish Influenza, ten Lutheran hospital nurses left the city…for Fort Benjamin Harrison…where they will enter service in the military base hospital, which is very urgently in need of qualified nurses…as fifteen of the army medical officers…are stricken with the dread malady. Beckley: The story of these nurses who volunteered to care for the sick, knowing full well that they risked their lives doing so, must have been a familiar one to readers of the day – indeed, thousands of young people were doing just that when volunteering for the war effort – but to me, this is perhaps the most poignant moment in this story. Dozens of young women were willing to jeopardize their lives to help the sick. In fact, two of the 10 nurses from that article did lose their lives to the “dread malady.” Yet, while soldiers returned home to parades in the streets, these women quietly returned to their lives. They weren’t the only ones to stand against the flu. Regular citizens from across the state banded together to combat the illness. But before we get to that, let’s take a quick break. 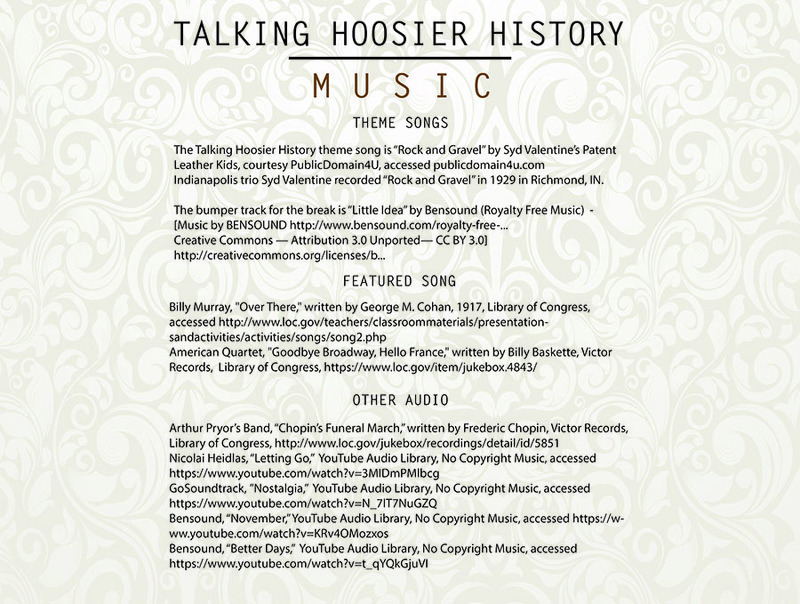 If you’re listening to this, you probably love Hoosier history as much as we do. Can’t get enough? Check out our blog, Blogging Hoosier History for compelling, informative posts covering a wide range of topics. 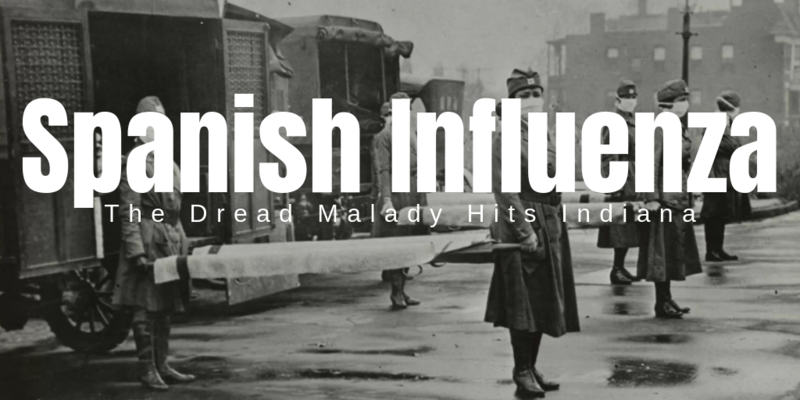 If you want to read more about the Spanish Influenza in Indiana, look no further. Much of the content of this episode comes from the post “War, Plague, and Courage: Spanish Influenza at Fort Benjamin Harrison & Indianapolis.” If you’re interested in other affects the epidemic had on Indiana, “Guns, Germs, and Indiana Athletics, 1917-1920: How Did the Great War and the Great Pandemic Affect Indiana Sports?” might be the post for you! Find those posts and more at blog.history.in.gov. Now back to the show. Day 13 – October 8, 1918 – “Citizens Join Hands to Stamp out Flu.” Officials are optimistic that compliance with meeting ban will keep illness in check. Voice actor reading from newspaper: They believe the situation is well in hand and it is felt that the prohibition of all meetings and gatherings will be a definite step toward arresting the epidemic. Open all windows in your bedroom and keep them open at all times, except in rainy weather. Take medicine to open the bowels freely. Take some nourishing foods such as milk, egg-and-milk or broth every four hours. Stay in bed until a physician tells you that it is safe to get up. Beckley: These instructions were posted in public places, reprinted in newspapers, and even reproduced in pocket sized folders to be distributed throughout the state and country. While many are good suggestions, the contagion, it seemed, could not be stopped. Day 17 – October 12, 1918 – 6000 cases of influenza in the state. Restrictions of businesses increase. The influenza epidemic is peaking in Indianapolis. Beckley: With the plague still spreading, Indianapolis officials expanded the ban on public meetings to so called “dry saloons” which were Prohibition Era gathering spots. All businesses, with the exceptions of wartime production plants, grocery stores, and pharmacies, had their hours restricted in order to stagger arrival and departure times of commuters to the city; factory workers, grocers, and druggists would arrive first, followed by retail workers and shoppers. Stores were forbidden to have sales, yet another measure to prevent crowding in the city. At this point in the epidemic, Indiana State Board of Health officials also started carrying cards reading “Quarantine, Influenza,”, and would post them on the doors of the sick. While the cards did not put the homes under a strict quarantine, as was done in some other cities, they did serve as a warning to anyone contemplating a visit. Voice actor reading from newspaper: The Influenza-pneumonia record among the civilian population of Indianapolis and in the army camps in and near the city follows, the figures on new deaths and new cases being for the last 24 hours: Civilian population: New cases: 252. Total: 2,942; new deaths; 28. Total: 198. Ft. Benjamin Harrison; New cases: 12. Total: 2948; new deaths, 4. Total: 165. Beckley: Day 29 October 24, 1918 – First signs of the end of this wave the epidemic surface, despite rises in new civilian cases. Voice actor reading from newspaper: A decrease in the number of new influenza patients admitted at Fort Harrison was shown for the 24 hours ending last night, only four being reported. Beckley: Finally, there appeared a light at the end of the long, dark tunnel. Fort Benjamin Harrison reported a vast decrease in the number of new cases reported. Since the Fort was struck before the city, citizens must have looked to this as a sign of hope. Still, the malady persisted; while only 4 new cases and 4 new deaths had been reported at the fort, the city reported 275 new cases and 12 new deaths. Ever cautious, city health officials urged flu victims to stay at home for treatment if possible. With hospitals overburdened and rooms crowded with as many beds as possible, it was often more safe and more comfortable to be cared for in the home…as long as proper precaution was taken by caregivers, of course. Day 35 October 30, 1918 – Bans and restrictions are lifted. New case numbers dwindling. Voice actor reading from newspaper: The ‘flu’ ban will be lifted in Indianapolis tomorrow morning and business will resume its normal course with only the minor health rules enforced. Beckley: Twenty-four days after the ban was first instituted, residents of Indianapolis were free to go about business as normal after the ban on public gatherings was lifted on November first. For the most part, the lifting of the ban signaled the end of the epidemic. There were some small resurgences of the illness in the coming months but nothing near as devastating as the October 1918 calamity. Just days later, the war which, at least in part, had facilitated the rapid spread of this dreaded disease, ended on November 11, 1918. As the city began its return to normalcy, the damage was assessed. In just one month, Indiana had lost 3,266 lives to influenza. More than half of these people died in their prime, many with spouses and children. As a result, 3,020 children were orphaned in the state during the month of October. While those numbers are grim, they could have been much worse. City leaders, business owners, and common citizens of Indiana and Indianapolis came together in a time of crisis, put away their differences and worked towards two common goals; keep people from contracting the flu when they could and treat those who had the flu as well as they could. This resulted in Indianapolis having one of the lowest epidemic death rates in the nation. Beckley: Once again, I’m Lindsey Beckley and this has been Talking Hoosier History. This episode was based almost exclusively on the work of Jill Weiss. You can read her Blog Post “War, Plague, and Courage: Spanish Influenza at Fort Benjamin Harrison & Indianapolis” online at blog.history.in.gov. Jill also does all of the recording, editing, and mixing on the show. Basically, without her, I’d just be in a room talking to myself about Indiana History. Also, a thank you goes to Justin Clark of Hoosier State Chronicles who is the voice of newspapers here on Talking Hoosier History. And thanks to you for listening! If you haven’t already, please subscribe, rate, and review us on iTunes. It really helps us get our name out there!